Earn free loose leaf tea! Each time you make a purchase in store or online, you’ll earn points towards free tea. For every dollar you spend in store or online, you will earn one point. For every 100 points you earn, you get 50 g of any tea! So, if you earn 300 points you get three 50 g bags of any tea for free! If you tell us your birthday (year optional), we’ll give you a free cup of any tea on that day! Just tell us a bit about yourself when you sign up and you will earn a free cup of tea. We care about our customers. Send us your comments here — It’s always appreciated! Buy 10 cups of tea in store, and your next cup of tea is free. Be the first to know about exclusive events and sales. Want VIP status? Earn free swag and bonus perks as a Super Steeper. Head to any DAVIDsTEA and sign up with your email address – that’s your new account ID! Create an account on our website then sign up through your profile page. Once you’re signed up, you’ll earn 1 point for every dollar you spend in any DAVIDsTEA store or on the DAVIDsTEA website. * For every 100 Frequent Steeper™ points you earn, you get to choose a FREE 50 g of any loose leaf tea, including select matchas. ** Once you hit 100 points, your reward will magically appear in your account within 24 hours. You’ll then have 60 days to redeem it in store or online – just give your email address in store or sign into your online account and head to your Frequent Steeper page, then choose whichever tea you’d like. * Excluding gift card purchases. ** Excluding Ceremonial Matcha and Organic Ceremonial Matcha. 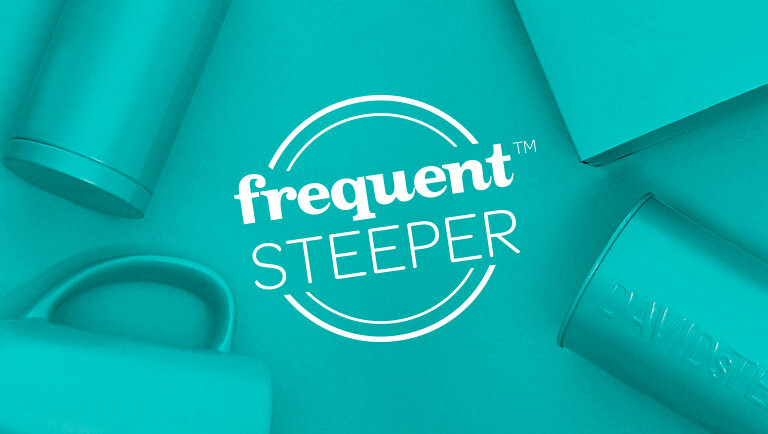 You can check your steep stats at any time by signing into your online account and clicking on the Frequent Steeper menu. Any rewards you’ve earned will appear in the Rewards Zone – you can either claim them online, or head to your nearest DAVIDsTEA and give your email address to a Tea Guide. Don’t have an online account? Click here.